A request from Liverpool to have police officers stationed on bridges along the route their team bus takes to Manchester on Tuesday night has been turned down. The club, wary of reprisals after Manchester City’s coach was bombarded with missiles before last week’s match at Anfield, lodged the appeal in a meeting ahead of the Champions League quarter-final second leg. It was rejected, although traffic officers will monitor the situation and act on any signs of suspicious behaviour. 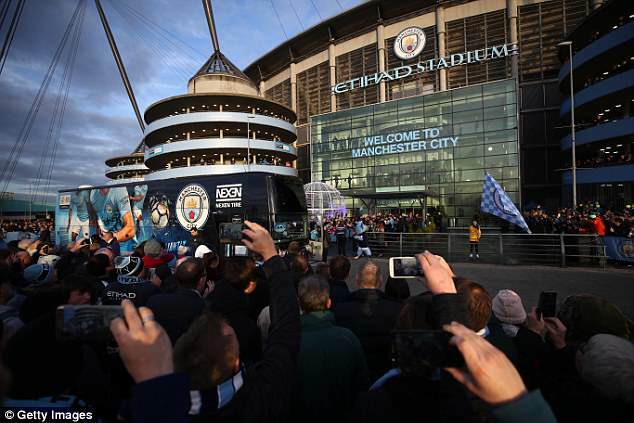 The move comes amid growing fury at City over Merseyside Police’s role in the events of last Wednesday, when their coach was attacked in Liverpool. Angry City officials are considering a formal complaint about the force’s handling of the situation. No arrests have been made in connection with the assault, when the vehicle carrying Pep Guardiola and his squad was pelted with bottles in ugly scenes that City feel could have been avoided. It can also be disclosed that a flare melted the roof of the bus, which is built to withstand a terrorist attack. 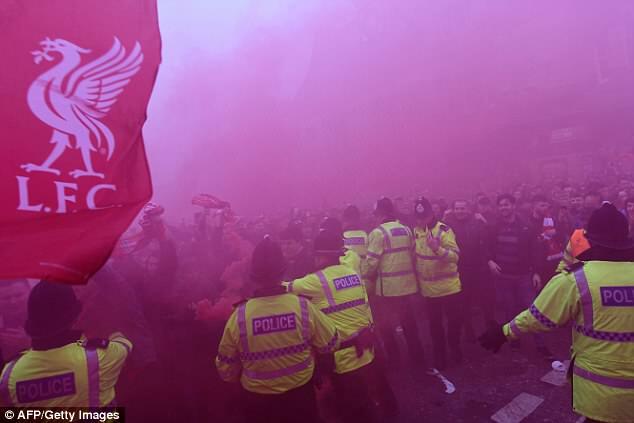 Sportsmail reported last month that City had expressed concerns to police over Liverpool fans planning a volatile ‘coach greeting’. They were stunned that a potentially problematic fixture had been given a B classification, signifying ‘medium risk’. Tuesday night’s match has been given a C rating for ‘increased risk’. The B classification is thought to have been based on a lack of serious issues at previous matches between the teams, although City’s coach was targeted after a visit to Anfield in 2014. A perceived lack of officers on the scene has been highlighted as a cause for City’s dismay, as well as the decision on the morning of the match to announce the route their bus would take to Anfield. An alternative route was offered, but this was deemed by City’s security staff to be even less safe. On arrival at Anfield, with two of the windows on the coach cracked, an agitated Guardiola sarcastically thanked Liverpool officials for their protection. However, speaking ahead of the return leg, he stated his confidence that there would be no reprisals. And the City manager had another dig at what happened on Merseyside. Greater Manchester Police are confident there will be no significant issues. Liverpool will use their regular bus and go through a service tunnel into the stadium, while City will head to the main entrance. 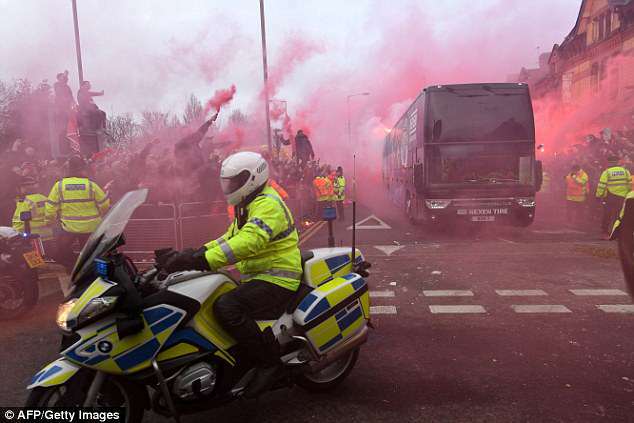 Police will move in should the need arise, although the biggest fear is that Liverpool supporters have bought tickets for the home sections following their 3-0 first-leg win, which makes them strong favourites to progress. Extra stewards will be on duty. Chief Inspector Dean Howard, Tuesday night’s match commander, said: ‘As part of this policing operation, we will have an increased number of officers around the stadium as well as in the city. Manchester City have been fined £25,000 after six of their players were booked in the 3-2 derby defeat by Manchester United at the Etihad. However, the FA will take no action against Ander Herrera after the United midfielder spat on the City club crest as he left the pitch at half-time.